If you haven’t heard about MonoTouch, then you need to be on twitter. MonoTouch allows you to write iPhone applications using C#! It’s in early, private, beta at the moment but it is very cool with huge amounts of potential. 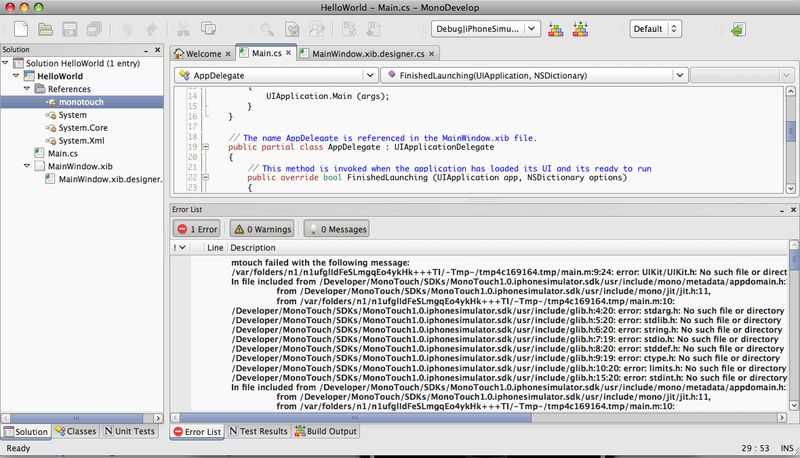 UIKit.h is one of the iPhone SDK files. I knew I had the iPhone SDK installed, however it turns out I didn’t have the 3.0 SDK! After installing the latest version, the application compiled without a problem. A note of the future in-case you hit the same error. UPDATE: Sorry about edits, I was playing around with MarsEdit and the formatting.